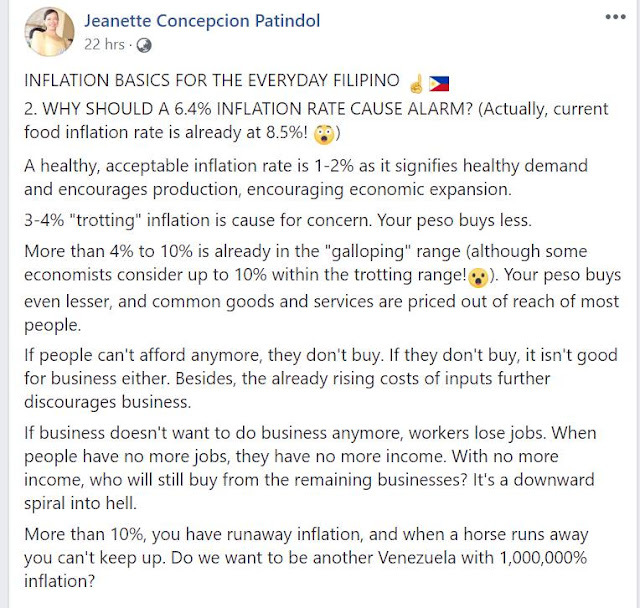 Home / Opinion / US-based blogger and accountant reveals the truth on inflation tactics of yellows: "MAG PANIC NA DAW TAU SA 6.4% INFLATION RATE"
US-based blogger and accountant reveals the truth on inflation tactics of yellows: "MAG PANIC NA DAW TAU SA 6.4% INFLATION RATE"
He even said that his post is not generally about the inflation and all these especially the Yellows are searching for awful news that they could assault Duterte on, there is nothing more to it, since inflation hits the community most particularly that the majority of what is on the inflationary bin are food products. He even mentioned the economists that are on facebook, writing about the inflation. He said that some of what they composed was lifted form the internet but because they have to change them so it would show up as though it is their own – “dun mo makikita ang mga feeling economists with semplang statements,” he said. He also put the one written by a certain Jeanette Conception Patindol. 1 1.) “6.4% inflation rate is cause of alarm." “Panic na daw tayo,” Edwin said. She most likely than not missed the historical inflation rate from 1988 to 1998, it began at 8.8% to a high of 19.7 ending in 1998 at 9.8%. Did we as a whole terrified around then? Would it be advisable for you to advise the population to freeze at 6.4%? The most exceedingly bad that you can do to the market is instruct them to go haywire. 2 2.) "a healthy, acceptable inflation rate is 1 - 2%." People should listen, one of the measurements to check how good or bad inflation is, is to compare it with economic growth. According to Edwin, he has been reading that the Philippine economy is projected to continue on its expansionary way and develop at a yearly rate of 6.7% in both 2018 and 2019. Along these lines in the event that we wind up with a normal of 6.4% inflation for 2018 and we keep up the development at 6.7%, is 6.4% still awful? 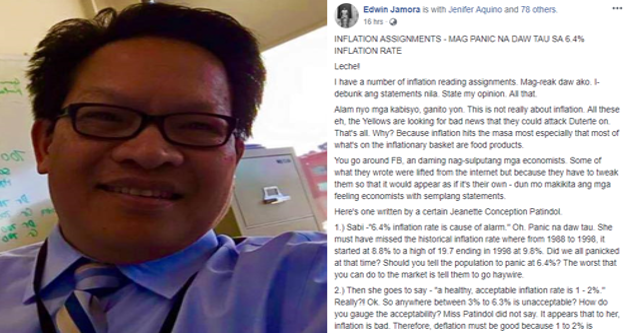 Edwin thinks that there are just two reasons why the Yellows love to attack the 6.4% inflation rate. The first reason he gave was, they want to assault Duterte, inflation is close to the people and it is the logical weapon that they use to attack now. Second reason that was given is that the Central Bank’s inflation forecast for 2018 was about 4.5% and so when the actual inflation rate hits over the first gauge, the Yellows began the panic drumbeat and that was a target. That objective clearly would in the end be influenced by the rising world oil prices and considering the aspects we currently know, they have set an impossible target. He also said that the comparison to Venezuela, we have been enclosed that in detail on the page and there is no contrast. He said that Venezuela’s concern is that their budgetary income is 90% on oil. What about the Philippines? We do not actually depend on a single revenue stream, we have OFW remittances at over $28 billion, and we also have BPO receipts shutting in at nearly a similar number. Our manufacturing exports and out tourism, at the end of the day, we are not dependent on one major revenue stream that if that streams stops, our economy would too. That is the contrast between Venezuela and Philippines. “You got me?! In fact, did I read that FDI, no matter how small compared to our neighbors continue to increase?” he mentioned. 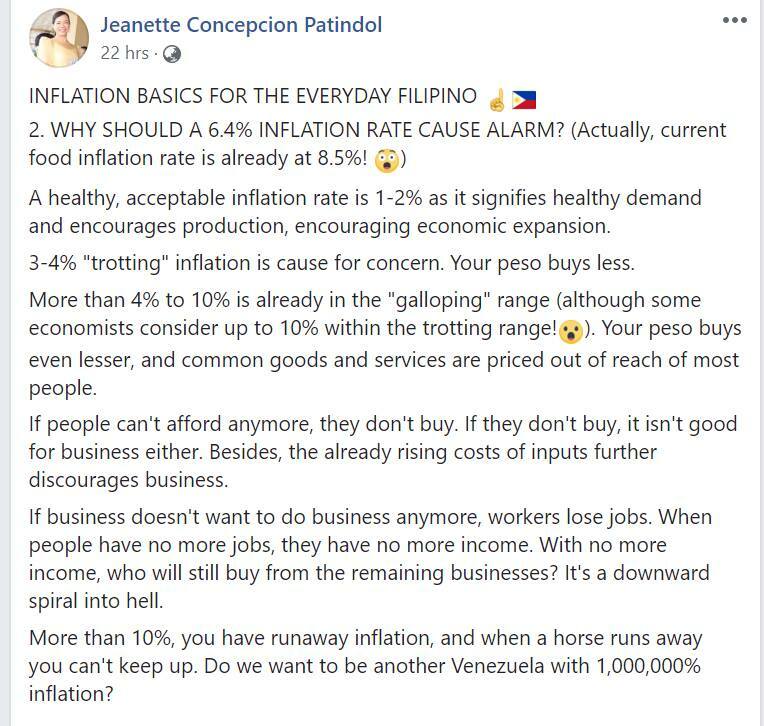 “So Miss Patindol claims that 10% becomes a run-away inflation. Huh?! Tigilan mo nga ako!” he added. And for everyone’s information, in 1984 we had a 50.3% inflation rate and it turned out bad, Venezuela route as a runaway inflation. “Check mo history! Why? Because we have a strong economic foundation here. Matatalino at magaganda ang ating mga economic managers! Our economic basket is not 90% on one single item. Remember that Miss Patindol,” Edwin said. So what do you think about this issue? What are your thoughts about the said inflation rate of our country?